1. Read the potty training articles. Talk to other parents. Weigh your options carefully and choose your method: when your toddler shows signs of readiness, you will try the three-day no-pants method. No pull-ups, just straight to underwear. Sticker rewards are a possibility, but you will never, ever use treats or other food items as a reward. 2. Your 18 month-old begins to poop at the same time each day. Decide that this qualifies as a sign of readiness. Try putting the child on the potty. He does not protest – yes, definitely readiness. Motivate him with stickers. Avoid changing a poopy diaper for one week. Pat self on back. You are almost there! 3. 18 month old refuses to ever sit on the toilet again. Choke back tears. Rescind back pat. 4. 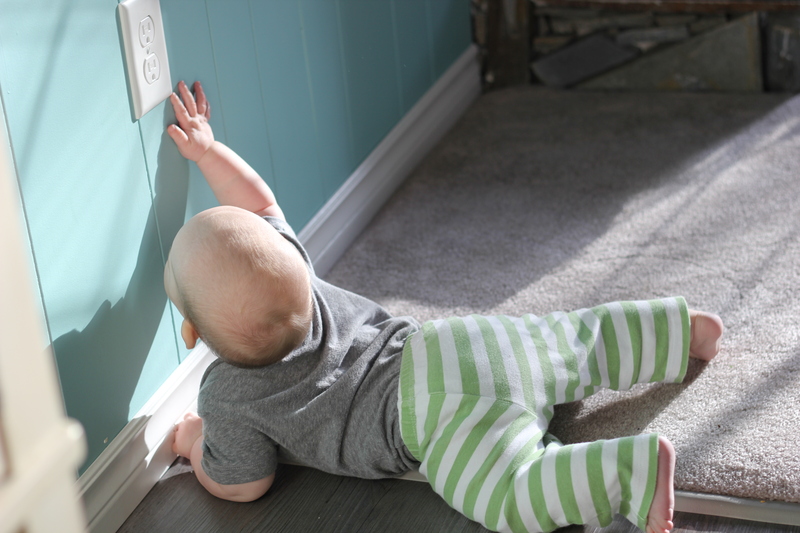 For the next year, every time your obviously pooping toddler heads to the corner of the living room for some “lone time,” offer stickers and other non-food rewards if he will just stop and come to the bathroom. Occasionally, beg. When he refuses, tell yourself he’ll be ready on his own time. 5. Spend time thinking about how infant poop is just so different from toddler poop. Toddler poop is like real people poop. You are very tired of getting up close and personal with real people poop. Wonder if there is a way to transfer your motivation to your toddler. 6. Tell your obviously pooping toddler that diapers are for babies. He must be a baby, not a big boy. Wish desperately for the power to turn back time when he agrees, putting on a screechy, whining “baby” voice and demanding to be carried like a baby. 7. Certain that it will not work, in a moment of frustration, offer a chocolate chip in return for a poop on the toilet. It works. Toddler happily runs to the toilet and does his thing. 8. You are now committed to chocolate chips as rewards. Stickers have lost their motivational power. Feel ashamed for a minute, then embrace the chocolate chip. Use chocolate chips for everything. 9. Recognize that the chocolate chip reward train has officially left the station when you observe your husband offering 5 chocolate chips in return for the toddler’s consumption of 5 black beans. This is not sustainable. 10. Curse your weak will when you cannot give up the chocolate chip bribery. 11. Curse your toddler’s strong will when he decides he is over chocolate chips, and resumes pooping in his diaper. 12. Remember your original plan to cut out diapers altogether with the 3-day no-pants method. Take heart – you just need to stick to the original plan and everything will be fine! Plan to spend a week at home doing the no-pants method. Pat self on back for this excellent decision. 13. Realize that you have a lot planned this week; maybe you should postpone until next week. 14. Realize that next week is Halloween; you should definitely postpone until after Halloween. Rescind back pat. 15. Buy cool underwear to motivate your toddler. 16. On the first day of no-pants potty training, remember that it’s the day after the fall time change. Oh well, that doesn’t really affect toddlers much, right? 17. Google the best method for cleaning pee off of your couch. 18. Rush to the store to buy more cool underwear, because all the cool underwear you bought last time is already in the washing machine. It is still day one. 19. Your toddler is a wreck. Wish again for the ability to turn back time – actual time, not just the clocks – so that you can tell yourself to postpone potty training until after your toddler has adjusted to the time change. 20. This whole debacle happens. Quit potty training for now and decide to resume maybe next week. 21. Try not to act surprised when after the spectacular failure described in #20, your toddler decides he wants to try again. 22. Your toddler refuses to wear pants inside. Resign yourself to the fact that your home is now pants-optional. 23. Have your first accident-free day. Pat self on back. Job well done. When I think of parents and embarrassment, I think of mortified preteens huddled in the corner of the gym as their parents dance the night away at the middle school’s family spring fling. Horrified adolescents covering their ears and pleading with Mum to just stop singing in the car on carpool day. Disgusted teenagers rolling their eyes and praying they won’t run into anyone they know as Dad tries on sunglasses at the drug store. Well, that’s what I would have thought a few years ago. But now, as the proud parent of a toddler, I have my very own collection of stories in which the parent is embarrassed, not the child. And I strongly suspect the embarrassing hi-jinx that parents of older kids get up to are payback for the public humiliations routinely suffered when their kids were little. Inspired by this post on Who Put Me in Charge Here, today’s story is about one of the many indignities I’ve experienced as the parent of my lovable Bean. Bean is a silly guy. He loves to make up strange stories and finds his own jokes hilarious. When he’s about to say something that he thinks is funny, he has a way of cocking his head to the side, leaning forward, and smiling a little half-smile up at me. One of his favourite games involves the car. When we’ve been out somewhere and are on our way back to our car, he’ll often point to each car along the way and say in an exaggerated manner, “Is that our car?” as if he’s forgotten what it looks like. When we get to our car, he pretends to be very excited and says, “Oooohhhh, there’s our car! !” Innocuous, silly fun. One day we were at the grocery store and Bean was in a silly mood. He was pointing at all the different packages, cartons, and cans in the aisles, asking in his silly toddler way, “We going to get that for our lunch?” I was happy, he was happy; it was kind of fun. But then another man came down the aisle – this one was a twenty-something college student type, carrying a shopping basket with his sullen-looking girlfriend. “Is that my Daddy?” This one was even louder than before. The young man looked up, startled, too awkward to respond. His girlfriend gave us A Look. We hurried down the aisle. A new man crossed our path. Didn’t women grocery shop anymore? Yup, that’s us. A mother and son, roaming the grocery store in search of milk, eggs, and an absent father. Any takers? That was enough to startle Bean into shyness, and we finished the shopping trip in relative silence. In the context of all the humiliations I’m sure to face as a parent, that one isn’t the worst. Still, if you need me, I’ll be working on my sweet dance moves in preparation for Bean’s 14th birthday party. The day started as any other. Bean, his parents, and his baby brother sat down to enjoy breakfast together. Yogurt, toast, and an apple: it was a typical breakfast for Bean, who was blissfully unaware that this meal could very well be his last. After breakfast, Bean made his usual request to watch a show. His parents offered the usual alternatives: trucks, playdough, trucks in playdough… or a colouring book. Bean chose to colour. Little did he know the impact that fateful decision would have. As Bean happily worked away with the crayons in his book, his parents cleaned up the baby and tidied up the breakfast table, never suspecting that their domestic normality would soon be shattered by tragedy. Suddenly, an ear-splitting shriek, the likes of which had never been heard, pierced the morning calm. Bean’s parents rushed to his side. “Look!” Bean sobbed, cradling one index finger in the palm of the opposite hand. “I don’t see – show me again?” asked his mother. “Oh, I see. Looks like you’ve given yourself a paper cut, and it’s starting to bleed a little,” explained his father, still clearly unaware of the gravity of the situation. Perhaps Bean’s parents were not to blame for their apparent lack of appropriate concern. Perhaps they were not aware of the sheer agony he bravely faced. Perhaps they were confused by the fact that Bean was a boy who could fall off the climber at the park without a sound; trip at high speed onto the pavement and skin his knee without a complaint; crash his bike into a tree with only a giggle. But these mild injuries paled in comparison to this new horror. The parents tried in vain to calm their wildly thrashing Bean, but their efforts were in vain. His anguish was too great. Finally, though the “leeding” had stopped and the trauma was mostly psychological now, the father presented a choice of Band-Aids. “No, airplane. No, car. No… airplane. Yes, airplane can do the job!” Bean was full of courageous optimism. Airplane bandage firmly in place, Bean wiped his tears with the shaking hand of a hero who has seen too much, and trudged off down the stairs to play. In time, it appeared that his wound had been forgotten. Convinced that he could not eat lunch while wearing a Band-Aid, Bean persuaded his parents to remove it from his finger. “Okay, but that’s it – once the Band-Aid is off you don’t need a new one again. We can’t keep taking them off and getting new ones all day,” admonished the father. The finger was inspected and all parties agreed that it looked much better. Maybe no one was thinking straight; maybe they were all weakened from the morning’s ordeal. We shall never know for certain. But what happened next was enough to test the mettle of even the most battle-hardened warrior. No one witnessed the acidic juice of the orange slowly creeping down Bean’s finger. No one noticed as it edged closer and closer to the hard-to-see-but-most-definitely-still-there wound. And then it made contact. Bean’s eyes widened; his mouth opened. As if in slow motion, he dropped the orange and raised his hand. His parents looked at the orange and looked at each other, realizing their gargantuan mistake. Why had they given him an orange, of all fruits? Why had they taken off the Band-Aid, that thin layer protecting the fearsome gash from the cruel elements? What could they have been thinking? They rushed Bean to the sink, over his protests, foolishly thinking that rinsing away the orange juice from the finger would help. As cold water hit aggravated wound, the suffering toddler could not contain his screams at this fresh torment. The poor, suffering boy was too far gone. He had endured too much. Nothing could help him now. Nothing except… a new Band-Aid. As Bean climbed off the bathroom counter where first-aid had been administered, he looked back at his parents, a single tear glistening on his perfect cheek. Back to work, like nothing had ever happened. His parents watched in awe, inspired by the sheer grit and tenacity of this brave tyke, who had traversed to the brink of defeat and back again to overcome in one short day that most horrendous of injuries: the paper cut. It hasn’t been long since the first Moments in Parenting Incompetence post, but I have so much raw material on this topic it’s already time for the second installment. Enjoy! My two year-old is obsessed with trucks. Obsessed. 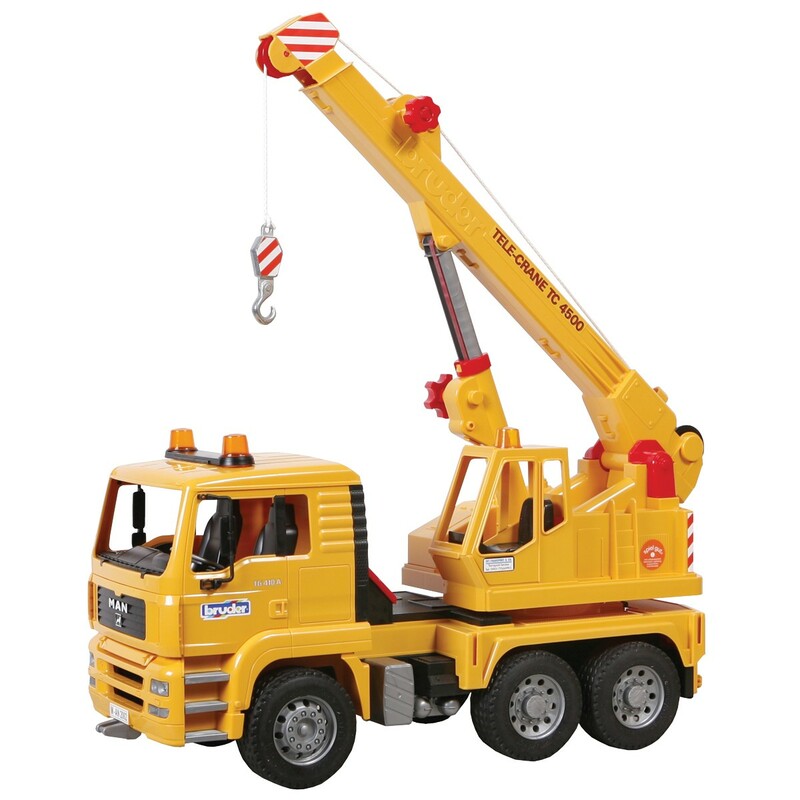 So last week, when I happened to see this crane truck at Winners for half the price it would be at a regular toy store, I jumped on it. Christmas is right around the corner, I thought. Or it could be for his birthday in February. I drove home, proud of my savvy shopping, thinking of the elation on his face on Christmas morning. A chronic last-minute shopper, this was also the earliest I had ever bought a Christmas present in my life. Then followed a series of truly incompetent moments. When I arrived home, I saw Bean at the window and so I left the truck in the back of the car, intending to come back out and get it after he’d gone to bed that night. I forgot. The next day all four of us were headed out of the house when I remembered the truck was still in the car. I frantically signalled to my husband, who was just about to put Bean into his carseat. He stalled while I ditched Monkey in his bucket seat on the driveway and went for the truck. But our timing was off. Before I could get to the big yellow box, Bean had climbed into the car by himself and was standing on his carseat, looking into the back of the car. I snatched the box away, but not before he caught a glimpse of the back of it, which has pictures of all the other trucks made by the same company. When I got back to the car, after I’d clicked the patiently waiting Monkey in, I lied through my teeth and told Bean it was garbage – an empty package from one of his old trucks. Then I turned the music up really loudly as we drove away. In the aftermath of Mistake #2, I had put the box in our laundry room/workshop and shut the door, planning on finding a better hiding spot later. The next day, Bean followed me into the laundry room and saw it again. I fed him the same lie about it being an old box from his old trucks and then distracted him by offering a cookie. A week later, the truck was still in the same place. That’s right – after two close calls, I still had not moved it. So I really do deserve what happened next. We were on day one of cold-turkey potty training, a method we were sure was going to work. (Run around the house in just underwear for a few days, with diapers only for naps and bed.) Bean was doing wonderfully, and was excited about the whole thing. He followed my husband into the workshop. He saw the truck. Not just the box, the truck itself. Hubby told him he could not have the truck. And then his little truck-obsessed toddler heart broke. Loudly. They came upstairs to me, Bean sobbing in confusion, my husband frantically looking for a way out. “Well…” I searched my brain for an acceptable answer. How do you tell a two year-old that the most amazing toy he’s ever seen, that is in his own house, that he has seen not once, not twice, but THREE times now, is meant for him but supposed to be a surprise so he can’t have it now and if he could just forget about it entirely that would be great? My husband and I looked at each other, recognizing defeat when we saw it. He was never going to forget, and we were never going to hear the end of it. He played with the truck, completely absorbed. He was so busy playing that he was no longer paying attention to his body and had an accident. And another. We’d inadvertently set him up for failure by giving him such an effective distraction. So, we decided that for day two of potty training, we’d tell him that the truck was going away and would come out again as a prize for when he’d had a whole day accident-free. We could fix this! It would be motivation! Why didn’t we just do this from the beginning? That led to an entire day of whining for the crane truck, pleading for the crane truck, and crying for the crane truck, followed by the entire potty training thing falling apart. The full detail of that particular failure is a topic for another day, but suffice it to say that the crane truck was the catalyst for an entirely incompetent series of events involving bribery, tears and frustration for more than one individual in this house. I’ve shared my shame with you… now it’s your turn. What important things have you completely messed up?